Olympia, WA - In the tradition of quality and excellence, American’s oldest cidery Spire Mountain Cider, is pleased to announce the release of their latest product, Crisp & Dry Apple Cider. “The hard cider industry has seen incredible growth over the past several years, and drinkers are embracing it as a refreshing alternative to beer or wine. As drinkers continue to rediscover the American cider tradition, they are interested in trying ciders with more complexity. We think our new Crisp & Dry cider fits that need perfectly” says Sal Leone, President of Fish Brewing Co. The Crisp & Dry Apple Cider is a semi-dry crisp cider with hints of green apples and acidic tartness, with a refreshing soft sparkling finish. This cider comes in at 5% ABV and is the perfect drink to pair with crème brule and fresh berries or a smooth brie cheese. Crisp & Dry Apple Cider will be available year-around to all of our distributor partners in 6-pack bottles, 22oz bottles, 1/6 bbl & 1/2 bbl kegs, and will be available in 16oz cans in the summer 2016. Spire Mountain’s year round and seasonal offerings highlight the natural flavors of Washington apples. Naturally gluten free and made from 100 percent locally sourced fresh pressed Washington apples, Spire Mountain products are handcrafted with real ingredients and never from concentrate. 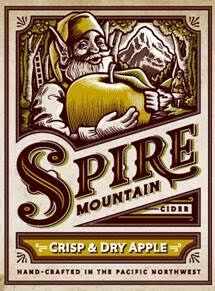 Look for Spire Mountain Ciders at a retailer near you. Founded in 1993, Fish Brewing Company is owned by over 400 beer drinking consumers, who pooled their resources to build a landmark brewery in Olympia, WA, which is known for its quality water and artesian wells. Fish Brewing also uses when possible locally sourced Washington ingredients. Fish Brewing produces hand-crafted beers and ciders under our three core brands: Fish Tale Ales, Leavenworth Biers, and Spire Mountain Cider, which can be found in 20 states and internationally, both in bottles and on draft. Fish Brewing operates a full service pub in Olympia, WA, which was featured on the Food Networks show Diners, Drive-in & Dives, and a new taproom in Woodinville, WA. Fish Brewing believes that fresh beer and cider, fine food, and enduring friendships are what life in the Great Pacific Northwest is all about. For more information visit, www.fishbrewing.com.